This page contains a guide on how to easily earn money in Persona 5, including conditions, locations, dungeons and methods. In Persona 5, you’ll need a lot of money. Weapons, medicine, special events, or gifts for confidants all require money. Aside from selling the trash that you pick up from the Palace, there are several ways that players can get large amounts of money. Raise the rank of the Sun Arcana to 3. Make sure that you have unlocked Chemdah in Mementos. 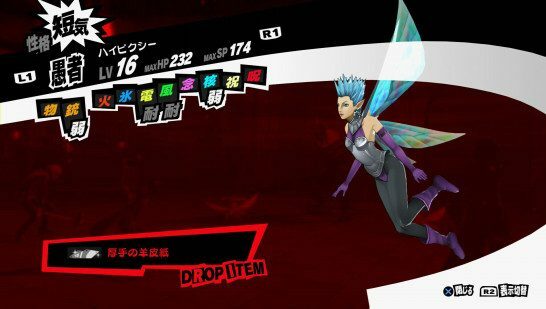 Walk around the Mementos Dungeon and look for a High Pixie to battle. Talk to the High Pixie and ask for money. Once the enemy gives you money, keep asking for more. Wait for the High Pixie to get back up and call for reinforcements. Repeat steps 2 to 5. No matter how many times you repeat the process, you’ll always get money. This means that you won’t need to encounter other High Pixies over and over again. Just remember to hit the weak points of the enemies to knock them down and execute a Hold-Up. High Pixies appear in area 1, 2, 3, 4, and 5 of Chemdah. With this method, you should be able to obtain tens of thousands of yen with just one Memento infiltration. This one involves the farming in the World of Qliphoth. While it is one of the last dungeons in the game, you can farm this dungeon and carry your money over to New Game+. This can be a bit difficult, however. You have to look for the persona, Kali. However, she doesn’t have any weaknesses. But if you have Ann’s Tentarafoo ability and Stagnant Air, you can confuse her. After confusing her, she will occasionally drop money. You can easily find Kali by looking for a shadow engulfed in a red aura. Most of the time, the Shadow drops at least ¥10k+ each turn. She also drops a few valuable healing items like Chewing Soul and Life Stones. Repeat steps 1-3, except instead of letting it get up, take the shadow down. With that, your money will not only double but you’ll also have the money from killing the shadow as well. With that, you’ll not only have yen to customize your weapons, but also to buy back any Persona you itemize. I think the name of the dungeons for the High Pixies spawn is wrong because I didn’t see any in Chemdah and level 5 is the break room. I did, however, find High Pixies on Kaitul. Confusing the memento bosses using Pulinpa and Confuse boost works much better. Just have joker go in by himself so you can pass turns more quickly or with a healer if you need it. Use an SP restore 3 patch. Onmoraki learns Pulinpa at level 14 and confuse boost at level 15. As Madasa said, depending on how far you are the bosses throw between 30k-100k and you can farm millions of yen per hour. I’m impressed, I have to say. Really not often do I encounter a weblog that’s each educative and entertaining, and let me let you know, you may have hit the nail on the head. Your idea is outstanding; the difficulty is something that not enough individuals are speaking intelligently about. I’m very comfortable that I stumbled throughout this in my seek for one thing referring to this. So what would the virtue deprived road translate in the paths in mementos?